We are excited to offer on behalf of one of our clients this outstanding 1972 Porsche 911 S Targa. Original Italian delivery which was imported to the US in the 80’s. This is a 100% matching numbers S Targa in highly desired light ivory over black interior. Factory equipped with sport seats for driver and passenger and rare through the grille fog lights! Porsche CoA is available. With only 101k kilometers (65k miles) this genuine low mile 911 is mainly un-restored and in fantastic, original condition. One professional re-spray to original light ivory was executed in the 1990’s and shows very nice. This Targa is with its 3rd owner in the US and has been very well taken care of. It comes with its original service book and manuals, complete tools, jack and spare. No rust or rust repair ever! The Targa top has been refinished and the engine has been updated with Carrera chain tensioners. 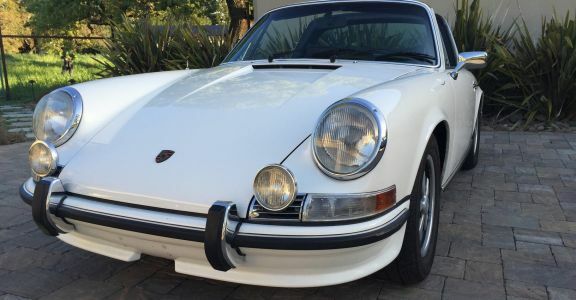 The 72 911S Targa is the most desirable of the long hood 911s for many reasons. The 2,4l engine with mechanical fuel injection is putting out a whopping 190hp making it the strongest and fastest early 911 aside from the famous Carrera RS. Further 1972 was the first year for the improved 915 5 speed gearbox and 1972 is the only year with the outside oil filler. This is a fantastic opportunity to acquire a highly collectable early 911S Targa. Only 989 S Targas were built in 1972. Ready to be enjoyed and a perfect car for your next Rally or Touring event!